Bent Hoie (left) and his husband, Dag Terje Solvang. OSLO — Norway’s most high-profile openly gay politician will attend the Paralympic Games in Russia with his husband, despite the controversy surrounding Russia’s anti-gay propaganda law. 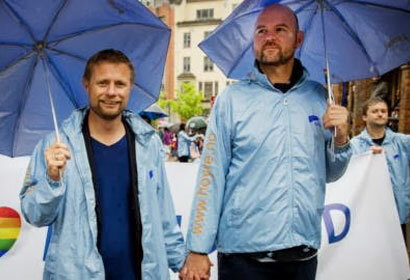 Bent Hoie (left) and his husband, Dag Terje Solvang, at Oslo Pride in June 2013. Health Minister Bent Hoie said Monday he would bring his husband, Dag Terje Solvang, a senior advertising executive, to Sochi, Russia, when he attends the Paralympics, which will be held in March following the main Winter Olympic Games. Hoeie said it is normal for a cabinet official to travel with a spouse on such an official visit. Bard Nylund, the leader of the Norwegian LGBT Association, called on Hoie to make a statement on gay rights. Hoie’s announcement comes following a nearly seven month global campaign by LGBT rights activists calling for a boycott of the Winter Olympics over passage of Russia’s anti-gay laws. Russian President Vladimir Putin has said publicly that the law is intended to protect young people and not discriminate against gays. But many western leaders, including U.S. President Barack Obama, French President Francois Hollande and British Prime Minister David Cameron have declined to attend, and are instead sending lower level officials in their place. The U.S. is sending three openly gay athletes as part of its delegation. Gay rights activists claim that Russia’s anti-gay law has contributed to an increase in anti-LGBT violence in Russia, casting a shadow over the $50 billion games.